We thank our Holiday Programming Sponsors: The Sheridan Family and Beckerle Lumber, Inserra Supermarkets, US Information Systems, Jade Abstract, Red Hill Nursery, Sotheby’s, Goldstein, Karlewicz & Goldstein, LLP, Mahoney Group – Merrill Lynch, Dr. Davies Farm, A&T Healthcare, Bourghol Brothers Jewelers, Carlo Minuto Carting, David Scharf, DeCicco Family Markets, Urcioli, Fagan and Gusmano, DDS, Robert Fenster, Esq, Freeman & Loftus, Hudson Valley Bank, Koblin’s Pharmacy, The Orchards of Conklin, Seth Glasser, Stephen Tilly, Architect, Environmental Construction, Inc.
Price: $64 per person (HSRC members); $69 per person (non-members). Includes bus transportation, guided tours, and buffet luncheon. Join us as we travel to the sites of several of Orangetown’s and Clarkstown’s most historic and best-known pipe organs. Guests will experience these majestic instruments as their organists present classical, sacred, and popular selections. The History in Your Own Back Yard Series is made possible by a generous contribution from the Clarkstown Reformed Church. Guests will meet at the Waterwheel Restaurant and Cafe, 272 Route 59, Tallman, for a special viewing of a documentary film about the Waterwheel, followed by a guided tour of the mill and other old buildings on the property. The outing will conclude with a gourmet luncheon at the Waterwheel Restaurant and Cafe. Price: $FREE for the walk — but reservations are required — plus an optional $25 per person for lunch after the walk at Marcello’s Ristorante. Join Craig Long, Rockland County and Suffern Village Historian, for a guided walking tour of Suffern that will take you past many homes and businesses with interesting histories. The walk starts promptly at 9:45 am at the historic Lafayette Theater. Arrive early for parking in the municipal lot behind the Lafayette Theater or in Lot B, located at 15 Chestnut Street, near Marcello’s. Marcello's four-course luncheon following the tour includes a "Taste of Pasta" appetizer, organic green salad, choice of salmon or chicken entree, and dessert with coffee or tea. This outdoor festival will have activities for the entire family all around the beautiful grounds of the HSRC's 1832 Jacob Blauvelt House, including old-time games, stencil art, clothespin dolls and quill pen writing; tours of the Jacob Blauvelt House and restored barn; demonstrations of open hearth cooking, wood turning, lace making, and wool spinning; and a Tag Sale. We’ll also welcome back Nickel-O Farms’ pony (2 – 4pm), Peter Artin who will demonstrate the art of blacksmithing, and the Ramapo Fault Band who will play their wonderful music again this year. Presented by the Historical Society of Rockland County and Heritage of West Nyack (www.heritageofwestnyack.org), this year’s self-guided tour offers a look at historically significant buildings of West Nyack, including eclectic and charming residences and historically significant sites. Join us in this historic part of Clarkstown. Sponsored by: Beckerle Lumber's Remodeling Showrooms (www.beckerlelumber.com) and Sotheby's (www.sothebys.com). Join us we retrace the steps of Major John Andre and Benedict Arnold in Rockland County. Their act of treason was a pivotal point in the Revolutionary war. Guests will learn the details of this important historic event by visiting the places that were involved. On September 22, 1780, the two men met in the woods along the Hudson shoreline. Meet us at the Haverstraw Dutchtown park/playground by 9 am for a 15 minute walk each way, along the stroller accessible river path. Appearance by mystery guests! Bring the family! Before you leave Haverstraw, we can provide a driving map you can use to trace Andre's route through Rockland to Tappan. At 11 am we meet in Tappan's '76 House parking lot; our guide will take us to the site of the Andre trial and up to Andre Hill, the location of the hanging (a 15 minute walk each way). The Living Landmark Awards honor individuals who have demonstrated commitment and service and who have made a difference here in Rockland and beyond. In doing so, these individuals represent the County of Rockland’s spirit and history. The awards program was created to help bring awareness to the Historical Marker Program at The Historical Society of Rockland County. W. Gordon is the John M. Musser Professor of Psychology, Emeritus at Yale University, Richard March Hoe Professor, Emeritus of Psychology and Education, at Teachers College, Columbia University and Director Emeritus of the Institute for Urban and Minority Education (IUME) at Teachers College, Columbia University. Dr. Gordon also serves as Chairman of the Gordon Commission on the future of assessment in Education. Dr. Gordon has been named one of America’s most prolific and thoughtful scholars. He is the author of more than 200 articles and 18 books. Susan Gordon has been a resident and an active citizen of Pomona, NY for over 50 years. As a young physician and graduate of Howard University College of Medicine in Washington, D.C., she practiced pediatrics in Rockland County, with an office in Haverstraw from1954-58. She was one of three women recognized at the African American Chamber of Commerce of Westchester & Rockland Counties, Inc. 2000 Women's History Month luncheon, on March 9, 2000. She was the recipient of the "Children's Champion Award," given by the Early Child Consortium of Rockland County, New York, 1999, and the classrooms and computer center of the Martin Luther King Jr. Multi-purpose Center, Inc. Spring Valley, NY was dedicated as the Susan G. Gordon, M.D. Education Corridor, January 22, 2000. On December 7, 2006 she was honored, along with her husband, by the Rockland County Commission on Human Rights and inducted into the Rockland County Civil Rights Hall of Fame. Richard Deats worked for the Fellowship of Reconciliation (FOR) from 1972 until his retirement on June 30, 2005. A United Methodist minister, Deats taught social ethics at Union Theological Seminary in the Philippines from 1959 to 1972. A native of Big Spring, Texas, Deats holds a B.A. from Mc Murry University, an M. Div. from Southern Methodist University and a Ph.D. from Boston University. Jan Deats is a graduate of Southern Methodist University School of Music, a classical pianist and music teacher at the Elizabeth Morrow School in Englewood, NJ, the Rockland Conservatory of Music in Pearl River, NY and Manhattan School of Music. She is also on the board and faculty of Summer Trios. Guests will tour by bus, several of Clarkstown’s and Orangetown’s historic cemeteries including Snyder, Mount Moor, Old Clarkstown Reformed Church, Greenbush, Tappan Dutch Reformed, Rockland (Sparkill), Oak Hill, Old Mountain Road and more. A knowledgeable guide will board the bus at each stop, presenting the history of each cemetery. In addition guests will learn about some notable people buried at each cemetery. Although guests will be disembarking at 2 or 3 cemeteries, these stops will NOT involve a lot of walking. The day will conclude with a buffet luncheon at Casa Del Mare in Upper Nyack The History in Your Own Back Yard Series has been made possible by a generous contribution from the Clarkstown Reformed Church. Join the HSRC as we welcome Mary Lynne Malone, director of the Regional Museums in Harriman State Park, and her staff for an afternoon of live animals and nature activities. Participants will learn interesting facts about local animals including common misconceptions and folktales. Guests will also be welcome to visit the HSRC’s current exhibition, “Greetings from Summer Camp–100 Years of Groups Summer Camps in Harriman State Park,” made possible by generous contributions from: United Water, Orange & Rockland Utilities, The Sheridan Family, The Len Camber Trust, The Palisades Park Conservancy and Sotheby’s. The HSRC also gives special thanks to Elizabeth Sayles and the Palisades Interstate Parks Commission for their assistance with the preparation of the exhibition. Join us on a tour of grand houses on the mighty Hudson! Our first stop will be Kykuit, the stunning classical-revival mansion that was home to four generations of Rockefellers, one of America's most famous families. Next, guests will enjoy a buffet lunch catered by Tastefully Yours at the café at Philipsburg Mano, the 18th-century farm and provisioning plant owned by Frederick Philipse III, whose Dutch family owned most of the land in the region. After lunch, we will travel to Sunnyside, the 1830s home of Washington Irving, whose writings include The Legend of Sleepy Hollow and Rip Van Winkle. Price: $FREE, but space is limited and reservations are required. The group camping program in Harriman State Park started 100 years ago with the belief that parks should be for all people, particularly the underprivileged that did not have fresh air or leisure time. To address the needs of the urban poor, particularly in NYC, the Palisades Interstate Parks Commission instituted social relief programs at more than 100 camp facilities in Harriman State Park. Sponsored by social and philanthropic organizations, thousands of New York and New Jersey children came to the park every summer to experience nature. The program was so successful that it was repeatedly emulated throughout the country. To commemorate this centennial, the HSRC has prepared the exhibition “Greetings from Summer Camp: 100 Years of Group Camping in Harriman State Park," curated by Sue Scher, Professor Emerita of Social Work, Ramapo College. This exhibition and the associated auxiliary programming have been made possible by generous contributions from United Water, Orange & Rockland Utilities, the Sheridan Family, The Len Camber Trust, The Palisades Park Conservancy and Sotheby’s. The HSRC gives special thanks to the Palisades Interstate Park Commission for the use of their archival photographs. Ms. Peter G. Rose will speak on Dutch Influences on the American kitchen and American life, exploring the foodways brought to America by the Dutch more than three centuries ago and how they were adapted to new circumstances. Peter Rose is an author and food historian who has lectured on a variety of topics related to Dutch-American culinary history. This program is sponsored by the New York Council for the Humanities, a not-for-profit, independent affiliate of the National Endowment for the Humanities. Walk through History: Pearl River Hamlet When: Saturday, July 13, 2013 Where, Leaves the Old Railroad Station at 9:30am Price: $FREE, but donations are greatly appreciated Join Pearl River Historian Jim Cassetta for a stroll in downtown Pearl River. The tour will take you past many homes and businesses in Pearl River with interesting histories. We will walk along Main Street, Central Avenue, William Street and Franklin Avenue. Arrive early for parking: Park in the lot labeled "Defiant Brewery" at the intersection of Central Avenue and the railroad tracks, near the railroad station. Price: $FREE. Reservations are strongly encouraged. Price: $69/person ($64/person for HSRC Members). Includes bus transportation, guided tours and luncheon at Il Fresco Restaurant We are pleased to offer a bus tour of several historic churches, all over 150 years old. This trip, which is part of the NY State Path Through History Weekend, will include guided tours of: Reformed Church of Tappan (1694) Reformed Church of Clarkstown (1749) Greenbush Presbyterian (1812) The Old Stone Church – Upper Nyack (1813 – the oldest church building in Rockland County) Iglesia La Mision, formerly St. Paul's Methodist, South Nyack (1843) Christ Episcopal, Sparkill (1847) St. Charles AME Zion, Sparkill (1856) The trip will conclude after a delicious lunch at the historic Il Fresco Restaurant in Orangeburg. The History in Your Own Backyard Series has been made possible by a generous contribution from the Clarkstown Reformed Church. This presentation will place the local history of our county in a global context. Important regional events from the 17th to the 20th centuries will be linked to the significant contemporary developments in World History, which have had some important influence in our area. The specific details of our county's history will inform the global events that will be stressed. Upon completion of the lecture, we will have a greatly enhanced picture of local history because they will see it in the frame of global perspective. We’ll also leave the presentation with a clear understanding of the issues, which are important to World Historians. Thomas Mounhkall is an Adjunct Professor-Secondary Education at SUNY New Paltz. Join us as we visit the Brooklyn Botanic Garden and the Brooklyn Museum. First we will be guided through the Brooklyn Museum’s new exhibition, “Workt by Hand”: Hidden Labor and Historical Quilts,” showcasing approximately thirty-five American and European quilt masterpieces from the Brooklyn Museum’s renowned decorative arts collection. The exhibition examines the impact of feminist scholarship on the ways historical quilts have been and are currently viewed, contextualized, and interpreted. We will enjoy lunch in the Beaux Arts Court, surrounded by the museum’s collection of 19th century Paintings, then tour the Brooklyn Botanic Garden. Founded in 1910, the garden holds over 10,000 taxa of plants and each year welcomes over 900,000 visitors from around the world. Building on the past successes of other similar summits featuring drums and fiddles, this year’s event presents three Rockland-based ethnic accordion traditions—traditional Irish, Ukrainian and Mexican Norteño—and a talk by Dr. Marion Jacobson, ethnomusicologist and author of the new book Squeeze This! A Cultural History of the Accordion in America (University of Illinois Press, 2012). The program will be hosted by Eileen Condon, guest folklorist. "The Big Squeeze" has been made possible by the New York State Council on the Arts with the support of Governor Andrew Cuomo and the New York State Legislature, with special thanks to ARTSROCK. Patty Furlong, originally from the Bronx, plays the Irish button accordion in the key of C#/D and B/C. In her teen years, as a student of Martin Mulvihill, Patty won numerous New York and All-Ireland titles. She has played with The Chieftains and is one of the founding members of Cherish the Ladies. Patty and her band, Coolmagort, have performed throughout the U.S., Canada, Bermuda, and Ireland. Her first solo recording, Patty Furlong: Traditional Irish Music on Button Accordion, was named one of the top recordings in 1999 by the Irish Voice. Her forthcoming release is a CD with Sean Quinn. Patty is certified as a traditional Irish music teacher by the world Irish Musicians' Association, CCE (Comhaltas Ceoltóirí Éireann), headquartered in Dublin, Ireland. She teaches students weekly and has taught previously at the O'Flaherty Irish Music Retreat, Swannanoa, the Augusta Heritage Center, and Catskills Irish Arts Week. Stanislav Kosiv is a Ukrainian-born accordion player who has played with the New York City-based Cheres Ukrainian Folk Ensemble since its inception in the United States in the early 1990s. His repertoire on the piano accordion includes the folk dance tunes of multiple regions in Ukraine, as well as neighboring countries in the Carpathian mountain region, such as Hungary and Romania. Stan was born in the Ukrainian village of Perekhody but his family moved to the city of Lviv when he was a toddler. He grew up hearing his father play the accordion at home and at weddings. As a teenager he attended a musical preparatory academy in Lviv and graduated from Lviv's Lysenko Conservatory in 1976. After working as a professional musician and music teacher in Ukraine after graduation, Stan found himself longing to explore the musical and cultural worlds outside the Soviet bloc, and made the daring decision to seek political asylum at the American Embassy in Rome during a 10-day performing tour in 1977. He was granted asylum and with it, the freedom to travel freely and pursue his career in the United States. He immigrated to New York City in 1978. Stan performs regularly as a solo accompanist for numerous Ukrainian dance groups in New York City and its environs, and continues to play in dances and concerts with Ukrainian-American clarinetist Andriy Milavsky and other members of the Cheres Ensemble. Guty Lopez plays Mexican Norteño style button accordion with the New York-based Norteño band, Controversia Norteña. His wife, Maria Paramo, is the band’s lead singer. The group has been performing around the New York metro area over the last six years, in addition to playing festivals and club appearances in Chicago, Washington, DC, Virginia, and Boston. Guty grew up in the state of Oaxaca, Mexico. His father played Norteño style music on bass and guitar, and pushed Agustin to learn to play the accordion at an early age. Guty was not interested, but ultimately complied. Eventually, he learned to play saxophone, guitar, and bass, as well as the accordion. These are the instruments that characterize the typical Norteño conjunto, or ensemble. Maria and Guty have a six-year-old daughter, Destiny Lopez, who now plays la musica Norteña on the accordion as well. Destiny pushes her parents to teach her more, rather than resisting, as her father once did at her age. The band plays a mixture of the traditional Norteño outlaw and border-crossing ballads and folk songs (corridos and rancheras) and covers of hits by major Norteño bands such as Los Tigres Del Norte, Conjunto Primavera, Los Huracanes Del Norte, K-Paz De La Sierra, and Los Montes De Durango. The group also performs songs that Maria has composed herself in Norteño style. One distinguishing feature of Norteño music (which originated in Mexico’s northern states but is played all over rural and urban Mexico and throughout the United States today) is the adorno—the line of accordion playing that appears as an echo/enhancement of the singing, between the verses of the songs. Norteño bands and accordionists become known for their distinctive variations on the adorno. Price: $FREE, but reservations are required! 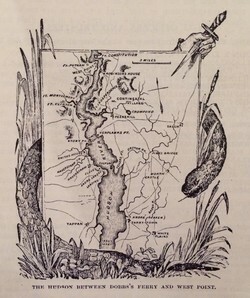 Don’t miss Robert Tholl, the son of Claire K. Tholl, who will speak about the new book The Maps of Claire K. Tholl, featuring 16 historic maps drawn by the noted Bergen and Rockland County historian and cartographer. Included in the book is a biography of Claire Tholl, a native of Hackensack who studied engineering and naval designing at Stevens Institute of Technology and graduated with a degree in architecture from Cooper Union in 1947. She began her historic research in 1944, after working as a draftsman and in boat design, technical illustration and cartography. She later added architectural photography to her interests. By 1960 she was studying old houses. She advised the restorers of Steuben House, Old Stone Church in Saddle River and Ringwood Manor in Ringwood, among many others. She also was knowledgeable about early cooking methods and utensils and the kind of foods favored in the past and the farms that produced them. For the Bicentennial in 1976, she wrote about foods of the past in the introduction of an illustrated collection of regional and historic recipes. The Annual Meeting of the Historical Society of Rockland County will be held Monday, April 8, 2013, at the HSRC, 20 Zukor Road, New City, at 7 p.m. in the Community Room. The order of business will include reports of the committees. Rarely seen objects from the Society's collections will be on display. All members of the public are invited. Visit the site that inspired Thomas Paine to write, “These are the times that try men’s souls.” Our first stop will be the A. Haring historic house on Piermont Road in Rockleigh. Then we will travel to Fort Lee Historic Park, which overlooks the Hudson River and the George Washington Bridge. Situated on a cliff-top bluff, it was the location where the Continental Army positioned its batteries over the Hudson River in 1776. The 33-acre park blends scenic beauty and history. Next we will travel to the USS Ling Submarine Museum on River Street in Hackensack. The USS Ling is the last of the fleet boats that patrolled American shores during World War II in response to U-Boat attacks off the coast of the United States. At this location we will also view displays of Polaris, Terrier, and Talos missiles; and three small craft: a Japanese Kaiten, a German Seehund, and a PBR Mark II. Next, we will enjoy a gourmet luncheon at the Sanzari’s New Bridge Inn in New Milford. After lunch, guests will travel either by bus or on foot to the Historic New Bridge Historic Site. This is the site of a pivotal bridge crossing the Hackensack River, where George Washington led his troops in retreat from British Forces. The site also includes the Major General Baron Von Steuben Mansion (circa 1752) and other Revolutionary War structures. Lifetime Service Awards presented to the Stokes Family (Marisol and John Austen Stokes, Elena Stokes and Claudia Stokes Cooney) in recognition of contributions to life in Rockland County and for service to and support of the Historical Society of Rockland County. A silent auction will be held during the cocktail hour and guests will enjoy live musical entertainment, award presentations and dancing. Proceeds from this annual event benefit the operating fund of the Historical Society. The Historical Society of Rockland County is a nonprofit educational institution and principal repository for original documents and artifacts relating to Rockland County. Its headquarters are a four-acre site featuring a history museum and the 1832 Jacob Blauvelt House in New City, New York. Come tour with us and find out about the really historic Stony Point...it's not just a battlefield! Relax on a comfortable bus while we tour the town, see the sites and step off to explore a few locations more closely. We will meet and board the bus at Fireside Restaurant on Rt. 9W in Stony Point. We'll step back in time, see the churches, landmarks, and homes of today and yesterday. Highlights will include the oldest houses, the Pyngyp School, the lime kiln, the Ice House ruins, the Mitch Miller House, "Teachers Rest," Stony Point Center, Gilmore Sloane House...and MORE! Please join us to see, right in our own backyard, the locations of significant happenings in our nation's earlier days. Price: $FREE, but donations are greatly appreciated! Leave the driving, tolls and parking to us! Join us as we visit the New York Historical Society. We will begin with a guided tour of "Nature and the American Vision: The Hudson River School," the critically acclaimed exhibition back from a national tour. It includes forty-five iconic works, including Thomas Cole’s five-part series The Course of Empire and other masterworks by Cole, John F. Kensett, Albert Bierstadt, Jasper F. Cropsey and Asher B. Durand. Following lunch at Caffe Storico, we will enjoy a guided tour of World War II & New York City. Finally, guests will have a little bit of extra time to review these exhibitions or visit other exhibitions in the museum.